After coming into a small fortune, a quiet closed accounts registrar named Mr. Berger decides to pack it in and retire. At only thirty four years of age and with countless years ahead of him, Berger decides to pursue his dream of becoming a writer. After a particularly frustrating evening with pen and paper, Berger embarks on a walk to clear his mind when he witnesses a young woman throw herself in front of a speeding train. However, a spotless track and lack of evidence leave both Berger and the authorities dumbfounded. Several weeks later, the same woman appears again and when an identical scenario threatens to repeat itself, Berger prevents the woman from doing so, chasing after her until she enters a large non-descript building. 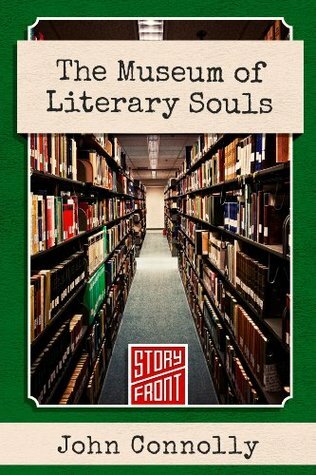 What Berger discovers inside will change his life forever..
Winning the 2014 Edgar Award for best short story, Connolly’s Museum of Literary Souls (or the alternate title (“The Caxton Private Lending Library and Book Depository”) reads like a love letter to literature. Connolly writes about the power of fiction and how truly great works can bring a culture together. Readers can often identify with certain characters, speaking about them as if they’re real people. My only gripe is given how deeply Connolly immersed me into the story, I was disappointed in how quickly the ending snuck up on me. While I have a deep appreciation for short stories (Hell, I even wrote a few), truly great ones always leave the reader wanting more. Don’t take this as a criticism but rather just a self-entitled reader whining. August 27, 2014 in Fiction, John Connolly.